It has been an amazing ‘Week of Peace’ action here in Auckland. The things that we have achieved collectively during this campaign – culminating this week – will go a long way towards building a stronger and more focused peace movement. The presence of a huge number of allies at our blockade of the arms expo on Wednesday demonstrates the possibilities of combining our power to tackle the root causes of modern warfare: the use of extreme violence by those who hold power to protect and enhance their power and to steal the resources of the powerless. An open letter to those supporting the US warship next week. It’s an interesting contradiction to me, when I observe the dichotomy of war and peace – that those who support war seem to want to portray the pacifists as idealistic, and out of touch with reality. As if those of us who oppose war are less realistic about the world than they are. As if their willingness to send people off to kill and die somehow makes them more pragmatic, more practical, than us. I see it as quite the opposite. It’s precisely my understanding of what war does to people, to families, to communities, that underpins my opposition to it. It’s precisely my understanding of the visceral nature of what a bomb will do to a child’s body that informs my resistance. It’s precisely my understanding of how the military industrial complex affects my indigenous rights, and impacts upon the wellbeing of my own whanau, whenua, and moana that frames my absolute refusal to accept it. People will say that Maori have a strong history of working with and for the military and to that I say – it’s PRECISELY that debt, that is consistently ignored by our government, that drives me to say what I have to say. Our tipuna laid their lives down on the lines for this country, for this government – and the agreement was that we would get equal treatment as citizens and that is not now, nor has it ever been the case. We cannot carry on ignoring that unpaid debt. Earlier this week I read that there will be a waka taua paddling out to welcome the arrival of the US Nuclear Warship arriving in NZ waters. According to the Navy it will be manned by the Tamaki Herenga Trust. This is the first US war vessel in our waters since we banned them in the 80s, and we have prided ourselves on being nuclear free ever since. 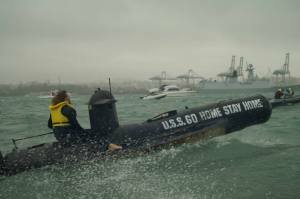 The US have used a loophole to re-enter our waters as a part of our navy’s 75 anniversary celebrations (by only bringing in nuclear weapons that area less than 5 kilotonnes) – and this is all timed for the international weapons expo as well – so our once proudly nuclear free, peaceful country is now hosting “The Week of War”. I will be there, protesting this abhorrent series of events – but I wanted to say something first. To you – the hapu/iwi who have decided to send this waka taua out. To you, the kaihautu-waka. To you, the kaihoe who will be paddling out to guide this ngarara into our waters. I want to tell you that I ABSOLUTELY KNOW what you are doing. I ABSOLUTELY KNOW what you are participating in. And I’d like to know that you do, too. WARNING – some of the images below are graphic and shocking – just like war. I’m sure those who claim to be “in touch” with the reality of these decisions will not be bothered by them. 1. When you send this waka taua out – you are representing us ALL. It will be seen, and promoted, as Maori endorsement of this kaupapa. Not the endorsement of your people alone, but by MAORI. I, and many others, resent that. This is an international event. The breaking of this seal is a seal that was put over all of Aotearoa, not simply your waters. Once it is broken, it is broken for all of us. In fact that same warship will be taking part in war-games (tactical exercises) that will be using live munitions in the Hauraki Gulf. The mana moana for that area stretches across multiple hapu and iwi, and the fish populations that migrate through there come across to many more hapu/iwi. One of over 30 military warships coming to Auckland on 15 November, the USS SAMPSON is stacked up with next generation microwave weapons as well as du weapons, harpoon & tomahawk missiles, and more than likely with micro-nuke warheads (<5 kT). The deck of a modern destroyer is unmanned because a person would be fried by the intensity of the microwaves in use. Marine biologist Terry Lilley who has been monitoring RIMPAC in Hawai’i said that they are called ‘destroyers’ because wherever they go, everything dies. These technologies are responsible for massive coral reef destruction off of Kauai and for kelp bed destruction off of southern California; this is the likely fate of kelp beds in the Hauraki Gulf after Mahi Tangaroa. The electronic waves also hold devastating consequences for sea mammals and fish life. Every two years pilot whales and turtles wash ashore in numbers during RIMPAC exercises. Dead whales, blasted turtles, and dead coral reefs – all resulting from naval military exercises the likes of which will be carried out in the Hauraki Gulf next week. THIS is what you’re supporting. The impacts of your decision extend well beyond your own mana whenua and mana moana. What is certain is that the tactical exercises carried out in those waters prepare these warships from MANY nations to carry out acts of warfare against other indigenous groups and innocent communities around the world. 2. When you send this waka taua out – you are ACTIVELY supporting warcrimes against indigenous peoples. “Exercise Mahi Tangaroa” is a brown mask placed over the Association of Southeastern Asian Nations) Defence Ministers’ Meeting – Field Training Exercise on Maritime Security. The ADMM-Plus countries include ten ASEAN Member States, namely, Brunei Darussalam, Cambodia, Indonesia, Lao PDR, Malaysia, Myanmar, the Philippines, Singapore, Thailand and Viet Nam, and eight Plus countries, namely Australia, China, India, Japan, New Zealand, ROK, Russian Federation and the United States. This military exercise will then be utilised AGAINST indigenous defenders of lands and waters in state bids to access their resources. YOU CANNOT STAND FOR ISSUES LIKE STANDING ROCK and, at the same time, support the military forces that are mobilised, every day, against indigenous defenders of lands and waterways. Even within our own Pacific Oceanic territories, countries like West Papua are under ILLEGAL occupation by Indonesia, and Indonesian forces are carrying out genocide, using tactics that are supported by the training exercise that YOU are welcoming into our shores. Our own Hawaiian cousins are under ILLEGAL occupation by the US who use them as a military base to assert their power over the Pacific nation. In virtually all of the participating countries, the military forces are utilised to clear indigenous peoples away from resources for large scale extraction by corporations. THAT is what you are supporting. While we are at it – OUR VERY OWN military is also utilised against us – kaitieki of Tangaroa and Papatuanuku, to clear us out of the path of corporate exploiters of our lands and waters. The Maritime Crimes Bill was passed this month for that express purpose and is built on the same international doctrines that the other countries use to case indigenous land and water defenders as terrorists. Do NOT come crying to us to support you when the oil companies come to drill your papamoana and frack your whenua. Those companies are a part of the very same military industrial complex that you are supporting. 3. When you send this waka taua out – you are ACTIVELY supporting militarisation in the Pacific. That militarisation has included the testing of nuclear weapons – which we as a nation have such a long and proud history of opposing. Do any of you admire and love our ocean navigating traditions? Do any of you aspire to travel on waka hourua? Do you know who we have to thank for much of what we see today in terms of ocean navigating? If you answered “Papa Mau Pialug” you’d be partially right. Papa Mau was a Micronesian navigator from Satawal. Micronesia also remains under US occupation, who utilise their islands as a naval base but most disgustingly, also test their nuclear weapons on their islands. The nuclear testing of past generations is still impacting upon new births. The radiation has stuck to their DNA. Grandchildren being born grossly deformed, with no bones, or born with cancer. Infertility, miscarriages, stillbirths, high cancer rates across the population. If any one of you dare to tell me that I am out of touch with the reality of the situation then you need to LOOK at these images. This is the reality of what is faced TODAY by these peoples. This is what you are supporting. WATCH THIS – You owe that much to the people of the Marshall Islands. Now, I said partially right because the other people we owe a debt to is our Tahitian cousins – Tahitian voyaging was also carried forth by Francis Cowan, who along with Matahi Brightwell voyaged across the Pacific to Aotearoa in the early 80s. Tahitian voyaging traditions are distinct and the peoples of this rohe of the Pacific ALSO have suffered nuclear testing at the hands of the French military and the militarisation of the Pacific is felt keenly by these areas (as well as Hawaii and I will go into that soon). THIS is how we repay the koha of Papa Mau and Francis Cowan… by supporting this continued hara upon their peoples? 4. When you send this waka out – you are endorsing the US illegal occupation of the lands and waters of our Hawaiian cousins. If Papa Mau is to thank for bringing us back the gift of ocean voyaging, our Hawaiian cousins are to thank for nurturing it. We, now, thankfully have a thriving waka hourua community across Aotearoa and the Pacific, but really it was our Kanaka Maoli whanau in Hawai’i that kept the fires burning, and invested time, money, and energy into nurturing this ancestral practice back into our lives today. Yet here we are blatantly ignoring the debt we owe them for this – by supporting the forces that maintain Hawai’i as a colonized possession of the United States. The forces that occupy 30% of Oahu. The forces that have dumped so many biological and chemical contaminants on bases that that land could no longer be used by anyone EVEN IF they did the right thing and left today. The forces that have dumped millions and millions of tonnes of mustard gas bombs, agent orange canisters and hydrogen cyanide canisters into the waters surrounding Oahu. The forces that continue to bomb numerous Kanaka Maoli sacred sites every single day as a part of their own weapons testing and tactical exercises. The forces that, themselves, are located on STOLEN LAND. Forces that have kidnapped, tortured, and murdered indigenous peoples for peaceful protests against the use of sacred sites for bases and testing. The same travesty is experienced by the communities in Okinawa that endure continued military presence, military testing, and military dumping on their lands. Okinawa, incidentally, is yet another site for indigenous peoples of Japan who were wiped out through militarisation. DON’T TALK TO ME about employment for our peoples when that employment takes the form of KILLING other indigenous people and robbing them of their land and resources. Just as our kanaka whanau have faced off against military in the defence of their lands so too will I face off against the military – I will spend my final breath fighting their oppression and I don’t care the colour or the whakapapa of who I stand against. In that space I am defending my ancestral rights and you, on the side of the military, are defending the Crown, the USA, and all the corporations they front. How can we possibly maintain a space of rangatiratanga over our own lands, and fight our government for the return of our stolen lands, while ACTIVELY supporting the theft of the lands of our cousins? 5. When you send this waka taua out – you are actively supporting the growth of US imperialism across the Pacific. We once were proudly nuclear free. Our Tamaki hapu and iwi led the charge that decried the use of nuclear weapons in the Pacific. We still, to this day, sing Herbs’ songs “Nuclear Waste”, “French Note (letter to France)” and “No Nukes”. We declared our country a safe-zone, we were David, and the US was Goliath. What we conveniently ignored was the fact that our country continued to participate (either overtly or covertly) in offshore military activity. That was the crack in the doorway. That crack was opened a little wider with improved military relations between this national government and the US govt – resulting in the signing of the Wellington Declaration in 2010. THIS signing paved the way for US and NZ official co-training for the first time since US troops were banned on NZ soil some 30 years beforehand. It was followed by the US / NZ combat training announcement, and Defence Amendment Bill. From there came the participation of NZ in “RIMPAC” – naval military war games that are responsible for the deaths of many, MANY whales and other sea mammals, and contamination of Hawaiian waterways. Then came the training of US Troops on NZ soil. Now we have the breaking of the seal for nuclear war vessels. If you CANNOT SEE the trajectory of the path we’re on then you need to open your eyes. HILLARY CLINTON HERSELF wrote that the next battlefield for global power tensions is NOT the Middle East, but Asia – and she, herself, pointed out the tactical importance of pacific military presence (really, read the article it’s scary as hell). It has never been more important for New Zealand to provide the US with a military base than now. Now go back – and read what US military presence has meant for our whanau in Hawaii, in Micronesia, and across the Pacific. THIS IS WHAT YOU ARE USHERING IN TO OUR WATERS. You may think you are operating on the mana of your people alone, but what you are saying, by sending out your waka taua, impacts upon ME, upon MY WATERS, upon MY LANDS, and upon the future of MY MOKOPUNA. And SO YOU KNOW – I will be facing you DIRECTLY with this knowledge when you carry out this act. That look in my eyes will be disgust, hurt, anger – and RESOLUTION. Looking at you will be the full force of my own whakapapa behind me, out to the furtherest corners of Te Moananui a Kiwa, and forward to the mokopuna that are yet to come. NOW YOU KNOW. Make your choice. Author Tina NgataPosted on November 12, 2016 November 12, 2016 Categories Uncategorized6 Comments on An open letter to those supporting the US warship next week.